As a double IPA, I definitely approve. Even though this isn't the most complex DIPA I've had (that would probably be Dreadnaught), it does have a fruity malt thing going on that is really delicious (contrast that with Pliny, which is rather dry). 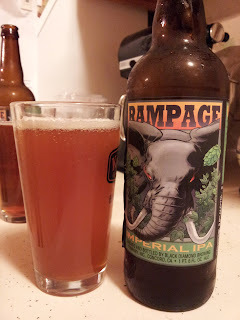 The level of hopping is not out of control (like Ruination), but I find it balances the hefty 9% out nicely; at least well-enough that I can easily put back the 22 without a Dorado-style recoil. In short, it's not perfect, but it's pretty damn good. I'll venture to classify it as a classic west coast double IPA, although I don't think the elephant with eyes-aflame is rampaging all over my palate. Even so, it sure is nice "as the nectar glides over the tongue", as Dr. Molar put it. One thing to note: if you plan to spill half of it on your only pair of pants for a weeklong trip, you best get over to TJ MAXXX and Maxonista it up, like I had to.